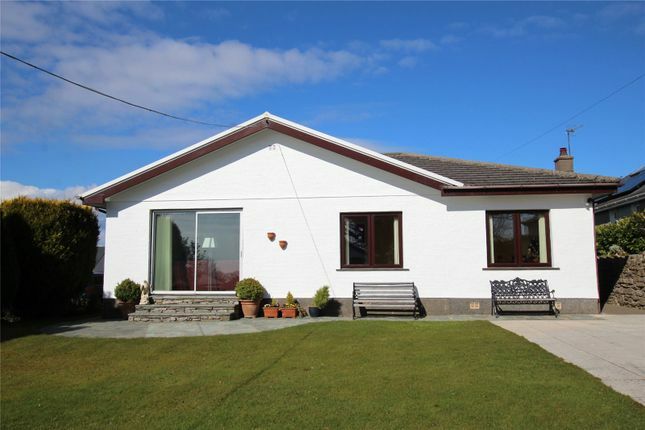 A large detached true bungalow, extensively added to, to create spacious family sized accommodation in a level position. The property could quite easily be split to create a self-contained annex. With the benefit of a private garden, off-road parking for four vehicles and a double detached garage. Situated in a small cul-de-sac off an "Access Only" lane, this is a quiet neighbourhood, ideal for families but also suitable for retirement. Grange-over-Sands is a Victorian/Edwardian coastal town, with its mile long promenade set along the shores of Morecambe Bay. Situated at the edge of the Lake District National Park, the town is a popular destination for visitors, with its mild climate, its range of individual boutique style shops and its ornamental gardens. Grange has a thriving primary school and is a very active community with a wide range of societies, including, amongst others, the ramblers, various drama and operatic groups, and North Lonsdale tennis club which has excellent facilities. Proximity to the A590 and the M6 makes Grange very accessible, as does the railway station, with services to Barrow and Lancaster and to Manchester airport. There is also a very good bus service to Kendal and Barrow. Travelling from our Grange office, head up the Main Street to the mini roundabout taking the first exit into The Esplanade. Continue out of Grange passing Cartmel Grange Nursing Home on the right. Pass the telephone box at the top and continue along Allithwaite Road until you reach Jack Hill. Take the left turn into Jack Hill and you find find Woodlands Drive further down on the left. Villamar is the first property on the left. Entrance Hall: uPVC double glazed entrance door. Upper Hallway:8'10" x 8'11" (2.7m x 2.72m). Double panelled central heating radiator. Recessed work station. Full bank of fitted cupboards. Cloakroom:7'7" x 4'7" (2.31m x 1.4m). With w.c. And wash basin. Plumbing for washing machine. Single panelled central heating radiator. Lounge:17' x 15'5" (5.18m x 4.7m). A spacious living room with sliding double glazed patio doors leading out to the rear garden. Two double panelled central heating radiators. TV aerial point. Recessed gas fire. Two arched recesses. Breakfast/Kitchen19'6" x 13'6" (5.94m x 4.11m). A large kitchen having an extensive range of oak fronted wall and base cupboards, incorporating breakfast bar. Five ring Bosch gas hob with extractor hood over. Electric fan assisted oven/grill. 1 ½ bowl single drainer stainless steel sink unit with mixer taps in a tiled surround with waste disposal. Integral dishwasher. Fridge and freezer. TV aerial point. Spot lighting and down lights to the ceiling. Utility Room:5'4" x 5'4" (1.63m x 1.63m). With plumbing for washing machine. Space for dryer and fridge freezer. Work surface and wall cupboards. Dining Room:19'7" x 9' (5.97m x 2.74m). Two double panelled central heating radiators. A bright and spacious living room which overlooks the garden at the rear. Rear Hallway: Tiled floor. UPVC double glazed entrance door. Bedroom 1:10'11" x 13' (3.33m x 3.96m). A double bedroom with double panelled central heating radiator. En-suite:5'8" x 6'11" (1.73m x 2.1m). With w.c pedestal wash basin. Shower Room: Fully tiled shower with shower run from the hot water supply. Fully tiled walls and tiled floor. Heated towel radiator. Extractor fan. Walk-in Dressing Room:9'9" x 6'5" (2.97m x 1.96m). With built-in wardrobes, drawers and shelving. Single panelled central heating radiator. Bedroom 2:12' x 11'11" (3.66m x 3.63m). Double room. Single panelled central heating radiator. Bedroom 3:8'4" x 8'11" (2.54m x 2.72m). A single room with single panelled central heating radiator. Bathroom:9'1" x 8'10" (2.77m x 2.7m). With three piece suite compromising w.c. Pedestal wash basin and panelled bath in a tiled surround. Double panelled central heating radiator. Shaver point. L Shaped Sitting Room:11'9" (3.59m) x 18'6" (5.63m) (max measurement). 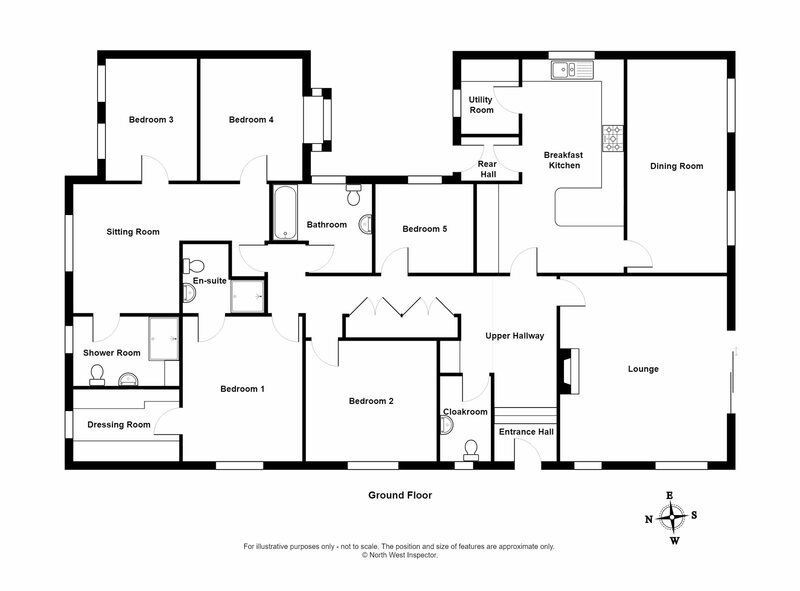 A large space ideal as a sitting room but offering excellent potential as a separate granny annexe. Double panelled central heating radiator. Bedroom 4:11'2" x 7'10" (3.4m x 2.39m). 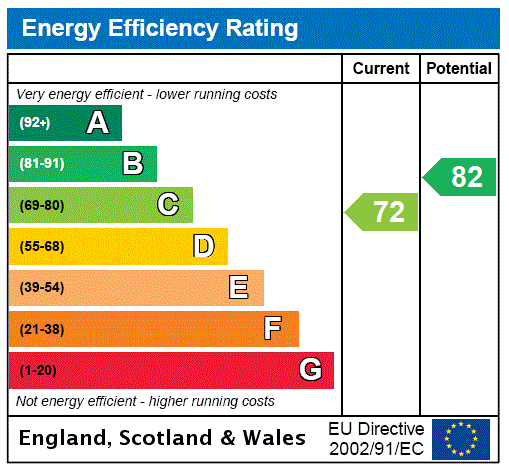 A double room with single panelled central heating radiator. TV aerial point. Telephone point. Bedroom 5:11'2" x 9'4" (3.4m x 2.84m). A double bedroom with single panelled central heating radiator. Shower Room:8'10" x 6' (2.7m x 1.83m). With w.c., pedestal wash basin and fully tiled shower with Aqualisa shower. Fully tiled walls and floor. Down lighting to the ceiling. Heated towel radiator. Garage:18'1" x 16'8" (5.51m x 5.08m). A good sized double garage with two up and over doors. Power and light. Garden The garden to the front of the property has been laid for ease of maintenance with mature trees and shrubs giving a good amount of privacy. The garden to the rear of the property is laid to lawn with good size patio/entertaining areas.